The Bianco Volto blender is a powerful kitchen appliance that allows you to prepare a variety of food and beverages. Six stainless steel blades made from Japanese steel crush food of all kinds very quickly and finely with a power of 1400 Watts and up to 32,000 revolutions per minute. The blender features 8 automatic programs, designed specifically for the preparation of green smoothies, fruit smoothies, soups, sauces, cereals, plants and nut milk. From frozen fruit, ice cream or frozen yogurt is easily made. Thanks to the manual mode, the speed and duration can be individually set. The setting is selected via two rotary knobs with which all of the functions can be controlled. A modern, simple display indicates the selected program. The intelligent power management system provides for a more efficient performance or iPMS-that regulates the speed automatically depending on the capacity and resistance. This ensures an improved result in solid foods. The T42L tamper features an integrated thermometer that is particularly useful when preparing soups or pasta. This allows the temperature to be read during the mixing process. The 0.5 l Tri-Set (mix-, drinking- and storage container) is also included, making it possible to safely bring food and drinks on the road thanks to the tightly sealed container. The Bianco Volto is protected from overheating thanks to a fitted temperature control. When put under substantial stress - for instance with heavy foods or too little liquid - the mixer should be left to cool in a well-ventilated place for approx. 45 minutes. Once cool, the blender can be used again as normal. The motor coupling is equipped with a predetermined breaking point. This protects the motor if the blades in the blender cannot turn because of a blockage (e.g. forgotten objects such as spoons). The coupling can be exchanged if it breaks. The mixing jug sensor detects when it is not correctly set up. Should the mixing jug not sit correctly on the motor, it is impossible to switch on the mixer. 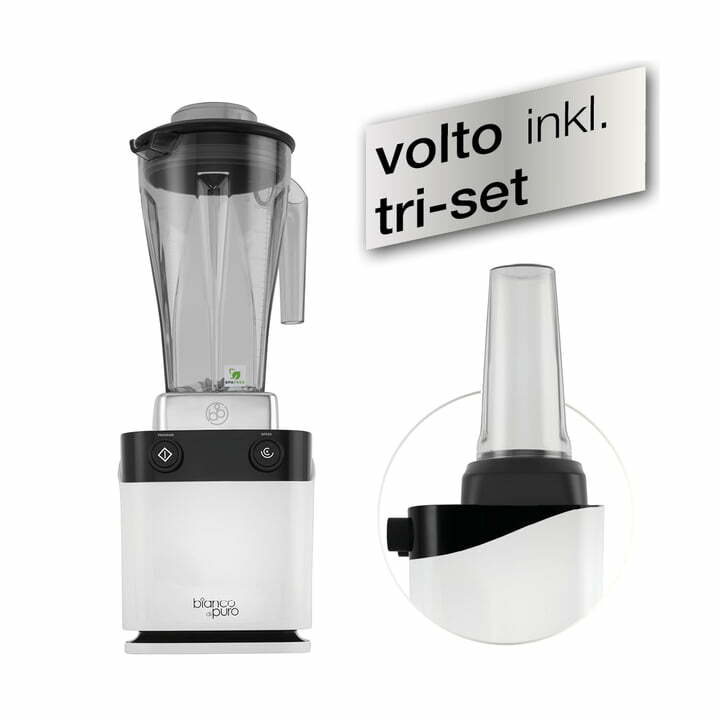 The risk of the Bianco Volto blender being damaged by incorrect use is thus prevented. Power plug type Plug Type C (CEE 7/17, contoured plug) - Used in: Europe, with the exception of the UK, Ireland, Cyprus and Malta. Please check, if you need an adapter for your country! 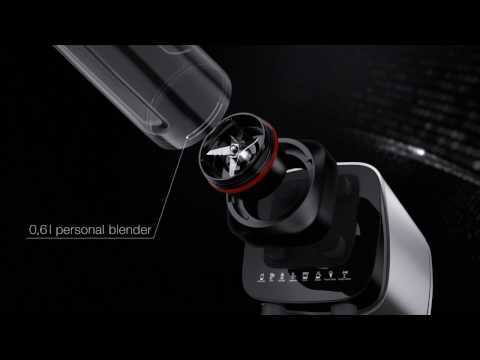 How does it work: Here the Volto Blender is presented once again by Bianco in a video explaining its functions and characteristics. The blender shows off its skills. Isolated product image of the Volto blender Incl. Tri-Set in white. The Bianco Volto blender is a powerful kitchen appliance that allows you to prepare a variety of food and beverages. The blender features 8 automatic programmes and a wide variety of accessories.